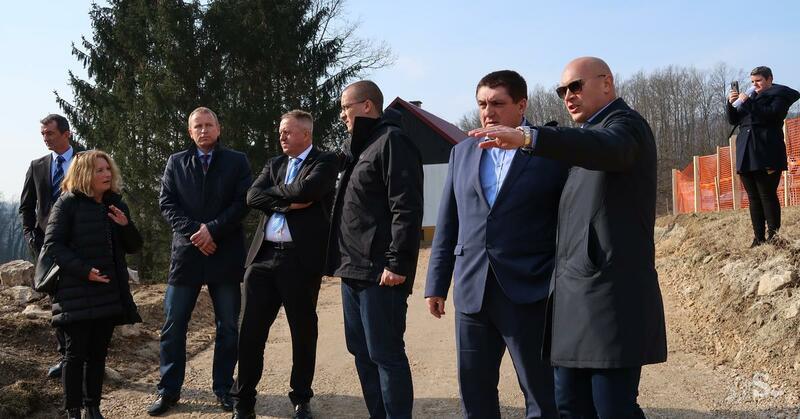 Vonarje, February 20, 2019 – Minister of Environment and Spatial Planning, Mr. Jure Leben togheter with the Minister of Economic Development and Technology, Mr. Zdravko Počivalšek, Director of Slovenian Water Agency, Mr. Tomaž Prohinar and the Mayor of Podčetrtek Municipality, Mr. Peter Misja, visited the Vonarje Dam during a working visit to the Podčetrtek Municipality. Minister Leben ensured the stakeholders that the measures to reduce the flood risk on the Vonarje dam will be completed by the autumn of 2019, as well as the project for re-cultivation of the Vonarje Lake. Since municipalities of Podčetrtek and Rogaška Slatina have great tourist plans with the lake, they have been actively working for the past decade with the aim to re-cultivate the Vonarje Lake.